Its free, its accessible, and it reaches billions of people. Social media is providing three key factors that should be putting dollar signs in the eyes of franchisors. Being active in your marketing efforts while maintaining control over how your brand is portrayed is a key for franchise success. Creating awareness, engaging customers, building customer loyalty, and boosting sales are all goals for franchisors, and social media doesn’t just accomplish these things; it does it with a smile. Smashburger, a fast-casual, gourmet burger franchise is a prime example of how a small business can catapult into the big leagues via social media. Birthing from three Denver locations, this restaurant became a smash hit with its expansion to 150 locations nationwide. With more than 77,000 followers on Facebook, reaching out to bloggers and their tweeting prowess, they have solidified the social media tools for expanding a franchise. Moral of the story, if you aren’t using social media you aren’t gaining the best exposure for your businesses. It is an opportunity to engage customers and that engagement can lead to loyal customers. Be sure to allocate enough resources to effectively manage your social media presence. Your franchisee will thank you. And even more importantly, they won’t go rogue. 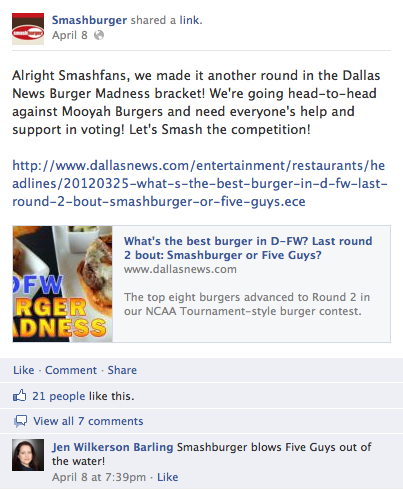 A big thank you to Bre Wolta for her research and help uncovering Smashburger’s social media success. The Weise Communications team is back from the International Franchise Association (IFA) conference in Orlando. The conference was full of highlights, including newest Hall of Fame inductee Jim Amos and his moving prayer breakfast speech; Bonny LeVine award-winner, SuperWash COO, Susan Black-Beth; the two keynote speeches – one was from host of the O’Reilly Factor, Bill O’Reilly and the other was New York Times best seller, Guy Kawasaki. 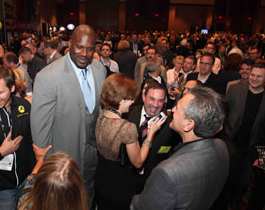 There was even an appearance by Shaquille O’Neal, performing a random act of Shaqness on behalf of the Original Soupman. The four-day conference didn’t disappoint. After sessions, roundtables and a host of meetings, here are the top five things Tracy and I learned at the conference. 1. In 2011, there was a lot of discussion about access to financing as the biggest hurdle to overcome for franchise systems to grow. In 2012, financing wasn’t nearly as significant of a topic. There appears to be much more optimism that economy is turning and that the rumored lowering of the corporate tax rate from 35% – 28% will keep the U.S. competitive in the global economy. They consider themselves health fanatics and live a lifestyle to back it up. They actively support causes and prefer to spend with companies that support causes as well. They are early adopters of technology and avid social media participants – more connections and greater frequency. 3. 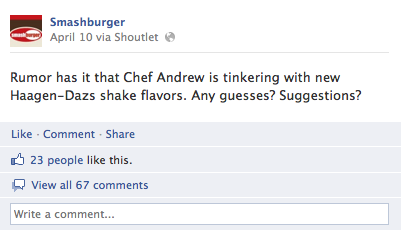 Social media in a vacuum is not going to sell you a franchise. Any franchisor that doesn’t believe in the value of social media most likely has the wrong mindset. Social media is not a vehicle to pitch products and services; it is one of the tactics a franchisor should use to develop a relationship with a prospect. According to Jeff Hayzlett, your social media goal should be to engage, educate, excite and evangelize. Thanks Jeff, your session was awesome! 5. Veterans are going to be a target and a trend for franchise sales and franchisors should strongly consider participating in Operation Enduring Freedom through the VetFran Program. For the uninitiated, VetFran is a voluntary effort of IFA members that offers financial incentives to encourage franchise ownership to honorably discharged veterans. We have a sixth thing we learned, you must be very careful at the passenger drop-off at the Orlando Airport. Cars, taxis and shuttle vans are constantly moving in and out of very tight spaces. It is possible for a person removing luggage out of the trunk of a car to get their legs crushed between their car and a run-away shuttle van. The results of Tracy’s MRI will be in later this week. See you in Las Vegas in 2013. On September 29, 7-Eleven will celebrate their caffeinated version of National Coffee Day, CofFREE Day, by offering all Americans a FREE medium-size cup of hot coffee (or cappuccino…or latte) from 7 a.m. to 11 a.m.
With more than 65% of Americans drinking coffee during the week (at nearly two cups per day), 7-Eleven found it only fitting to celebrate the beloved caffeinated beverage on its special day. 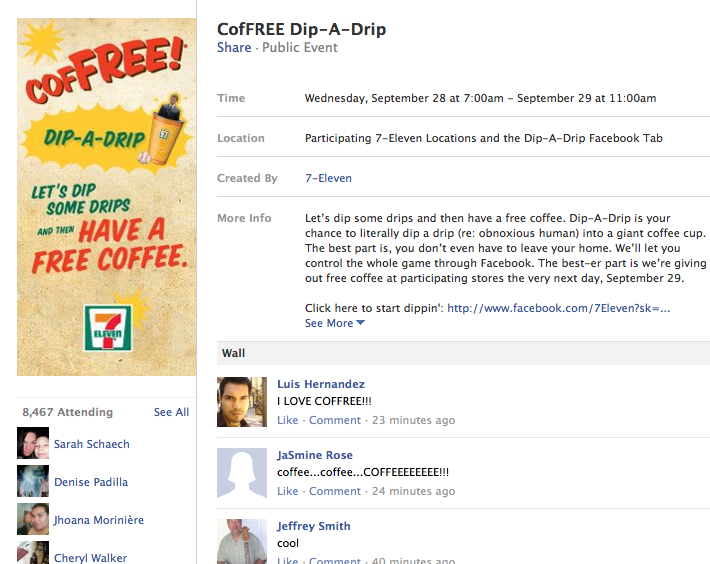 The celebration kicks off on September 28, with an interactive Facebook game called Dip-A-Drip. Drips are total pains; they are those obnoxious, over-the-top people who get on your last nerve. Dip-A-Drip (get it now?) is your chance to launch a ball that dips a Drip into a giant 7-Eleven coffee cup. Here’s the twist: that giant coffee cup will be setup live at Union Station in Washington D.C., so while you control the movement online, your Drip is being dipped in real-time. We here at Weise Communications love our coffee, so we will be excited to see how this interactive promotion pays off for the franchise system. What do you think about the 7-Eleven campaign? Will you get your free coffee on CofFREE day? Share with us here on The Side Note Blog. Weise Communications is back from the International Franchise Association (IFA) conference in Las Vegas (Feb. 13-16). The conference was full of highlights, from newest Hall of Fame inductee (Doc Cohen) and his moving acceptance speech, to 7-Eleven CEO Joe DePinto’s presentation on customer service and the two keynote speeches from former Massachusetts Govenor Mitt Romney and editor in chief of Forbes Magazine, Steve Forbes. The four-day conference didn’t disappoint. After five sessions, four roundtables and an executive forum, here are the top 10 things learned at the conference. Benchmarking KPI (Key Performance Indicators) through IFA ‘on track’ system is long over due. Props to IFA for making this happen and highlighting it at the conference. Financing is still the biggest hurdle to overcome for franchise systems to grow. The IFA continues to push for political and financial movement in this area, while many franchisors look for innovative financing options of their own. Integration of marketing tools is essential. Communication is no longer filtered through the media and our messages can go direct to the consumer. Thus, we need tighter control over what we say about our companies. A great way to get into the social media game is to use store locator maps on websites to help drive foot traffic. But, if you are using this tool, it is essential that locators are accurate and complete. The franchisor should own this operation, not the individual franchise owners. In 2010, there was a lot of discussion about using social media effectively in the world of franchising. In 2011, the entire conference could have been dedicated to this topic (@davemurr of Re Group). Franchise systems are increasingly savvy about driving consumers to their locations through mobile and location-based marketing, but still unsure how to use the same tools to sell franchises. Luckily we heard from some great systems that they are developing leads and closing sales based on their social media efforts. Social media is here to stay and it sounds like that message has been heard loud and clear by most franchise systems. Franchisors that still don’t believe in the value of social media probably have the wrong mindset. Social media is not pitching products and services; it is a relationship-building tool. When it comes to social media, like any other marketing outreach initiative, you need a plan that is realistic to execute and based on a legitimate goal. It also needs to be a sustainable plan because social media is not considered authentic unless it is ongoing. Separate training and support operational functions. Good professional trainers can get a franchisee started with excellent training. However, those skills are not necessarily successful for a franchisee operating for a while. They need a different level of support. Both of these functions need distinctive skill sets and most likely different people working on them. But the increased focus on the right area will increase franchisor profitability (@Mike_Walls of Caring Senior Service). Franchising industry must integrate social media with traditional methods and processes (@PaulSegreto of franchisEssentials). Social Media is a vital channel for growth both at the franchisee and the franchisor level (@JackMonson of Engage121). See you in Orlando in 2012.